The Bromeliaceae is a large family of 1400 species of sub-tropical to tropical flowering plants from the New World, often seen growing as epiphytes but also with species growing in the ground. Many Bromeliads store water in the "urn" formed by their tightly-overlapped rosettes of leaves and this oasis often forms a micro-habitat for small animals such as frogs. 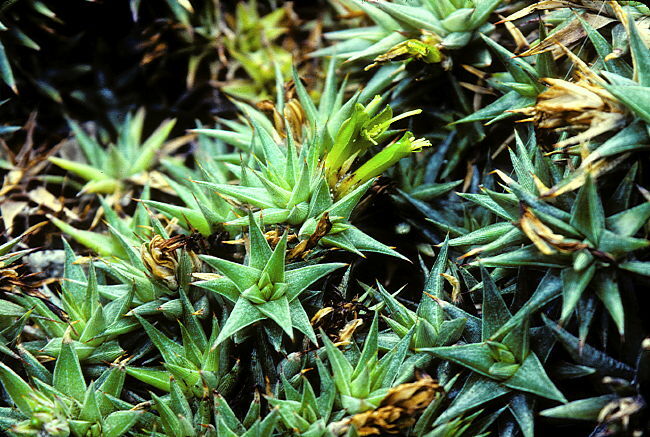 The epiphytic Tillandsia species capture moisture from the air through leaf trichomes. Bromeliads are generally monocarpic, but offset freely so that the clone usuall survives the flowering of an individual rosette. The fruit of the pineapple Ananas comosus is an important agricultural crop. 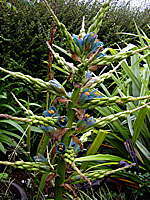 Many species of Bromeliad are of horticultural interest and propagated in large numbers as decorative plants, especially those species with brightly coloured bracts. Rosettes offset by suckering. 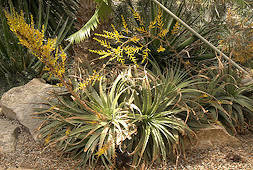 The genus Deuterocohnia includes 18 species of small succulent Bromeliads from Argentina and Bolivia. The rosettes of plump, sharply pointed leaves clump up freely to form dense mats. The inflorescence consists of small, yellowish-green flowers. 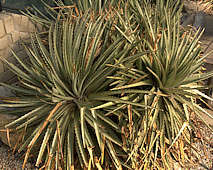 is a terrestrial Bromeliad forming dense cushions of tightly-packed succulent rosettes when grown in a good light. Individual rosettes are smaller than those of D. lorentziana. The grey-green leaves are sharply pointed and may bear a few small marginal teeth. 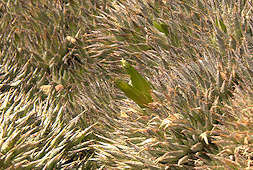 Inflorescences of three yellowish-green tubular flowers appear repeatedly on the same rosette, which unusually for a bromeliad does not die after flowering. This species is native to Argentina and Bolivia. May tolerate light frost. 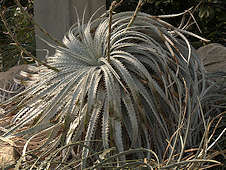 This large, clumping Bromeliad forms a dense mound of succulent rosettes formed from many light-green to silvery curving, lanceolate leaves with sharp marginal teeth. The branching inflorescence bears many small, tubular, bright yellow flowers with white stamens. This species is native to Peru, Bolivia and Argentina. May tolerate light frost. is a popular terrestrial Bromeliad forming dense mounds of succulent rosettes when grown in a good light. 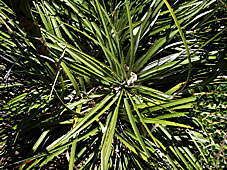 The grey-green leaves are sharply pointed and may bear a few small marginal teeth. 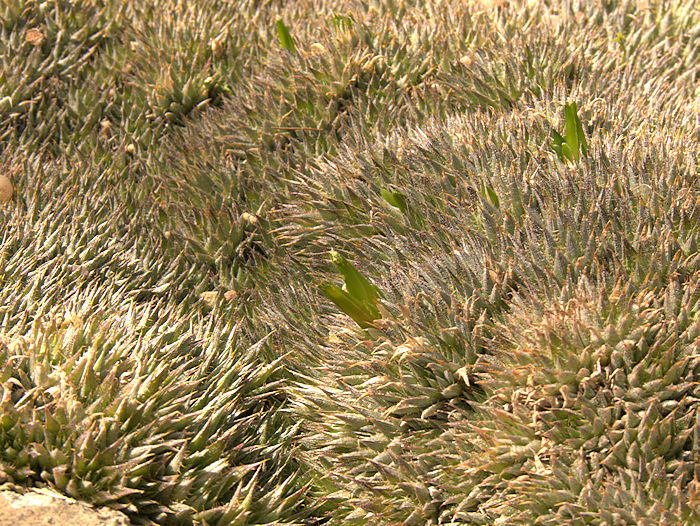 Inflorescences of three yellowish-green tubular flowers appear repeatedly on the same rosette, which unusually for a bromeliad does not die after flowering. This species is native to Argentina. 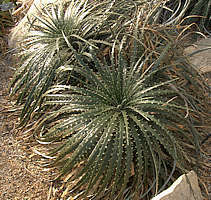 The genus Dyckia includes around 120 species of terrestrial Bromeliads with rosettes formed from stiff, fleshy leaves furnished with marginal teeth. The rosettes clump up freely to form mats. 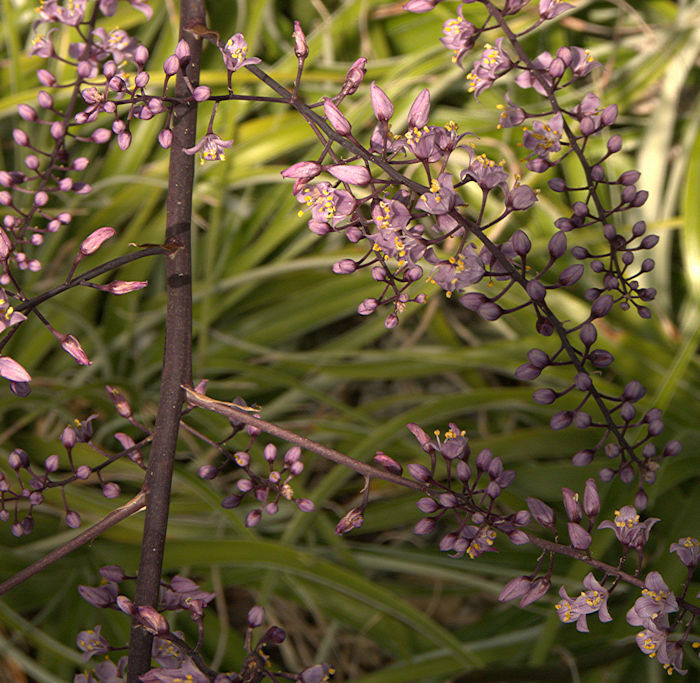 They originate in Brazil and central South America and tend to be drought and cold tolerant. 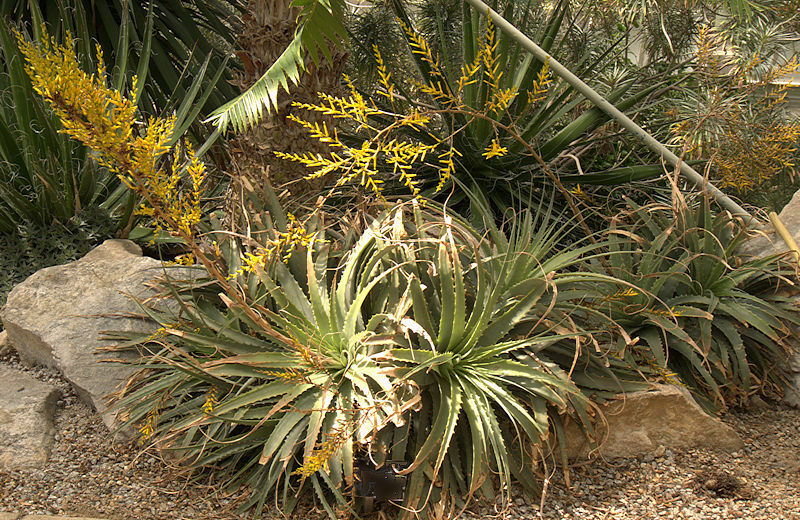 The genus Hechtia includes around 50 terrestrial and epiphytic Bromeliads native to Southern USA, Mexico, Guatemala and Honduras, of which 45 species are confined to Mexico. 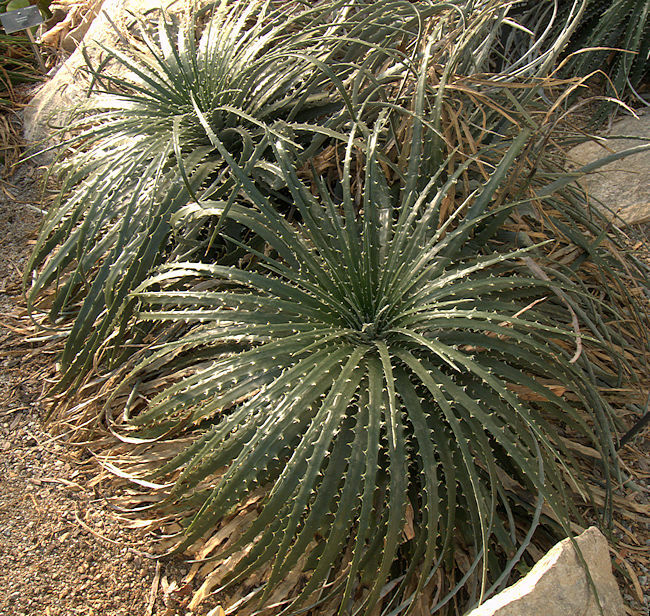 Hechtias have dense rosettes of long leaves, usually with sharp teeth along their margins. 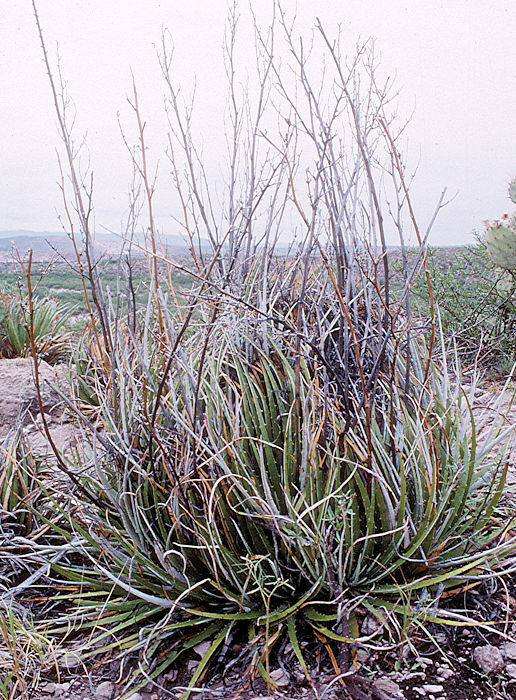 Most species are xerophytic and all are dioecious. 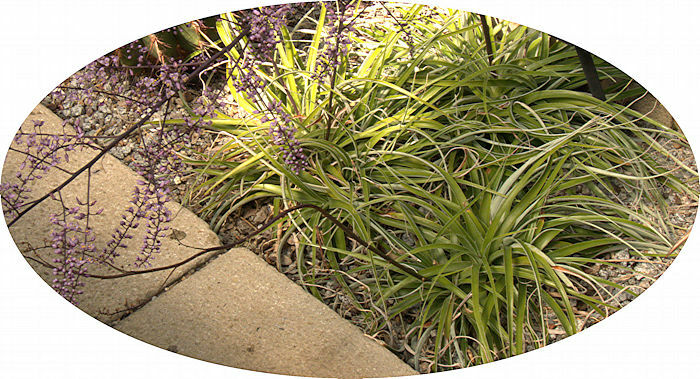 The long, pale green leaves taper to a point and have heavily toothed, silvery margins. 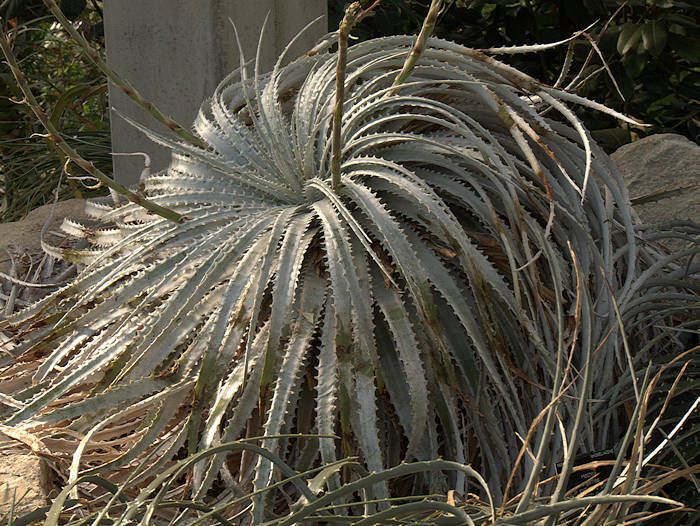 The silvery coating on the leaves develops with age, but is easily washed or rubbed off, soiling the appearance. 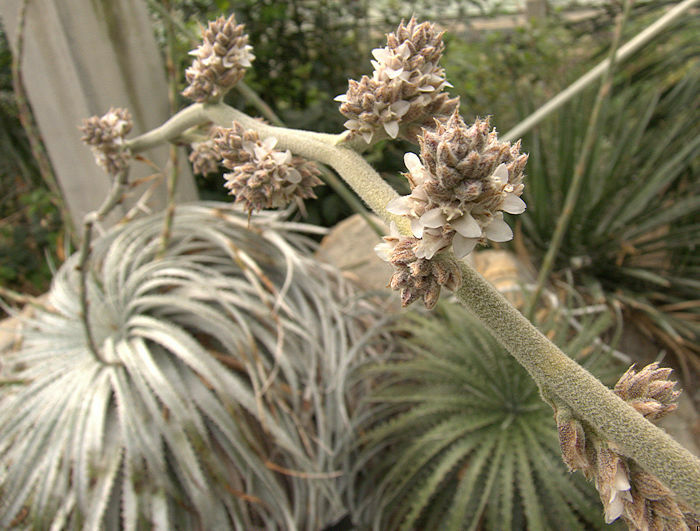 The long inflorescence carries clusters of white flowers on short spurs. Several flower stalks are produced by a mature rosette. 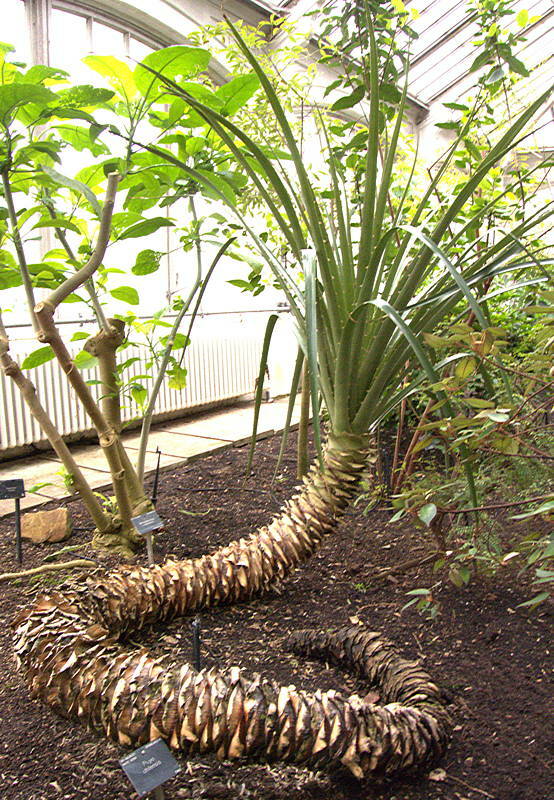 This venerable plant in the Princess of Wales Conservatory, Kew was discovered in a Mexican canyon in 1860, so is well over 150 years old. It was exhibited at the Plant Exposition in Brussels in 1864 where it was awarded "Best in Show". Some leaf discolouration caused by dripping water a few years ago is growing out. 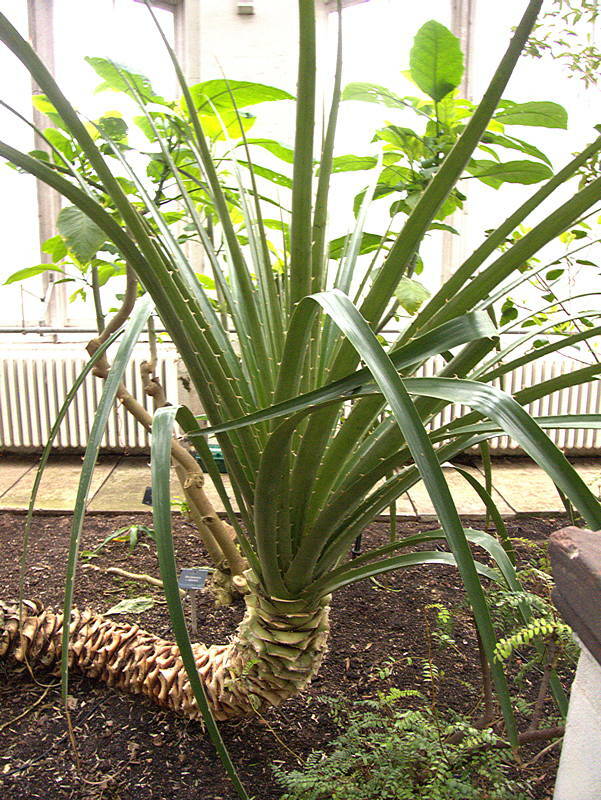 This xerophytic Bromeliad forms a large succulent caudex to enable it to survive hot, dry conditions. The long, tapering green leaves have well-spaced teeth along their margins. Rosettes offset at their base to form huge clumps. Hechtia texensis grows on limestone in Texas and Northern Mexico. Photographed in the Big Bend National Park near the Rio Grande. This Bromeliad forms a lax rosette from long thin concave leaves, coated with white on their lower surface and virtually spineless. 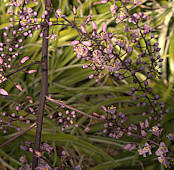 Mature plants produce a long branching inflorescence of small purple flowers with yellow stamens. 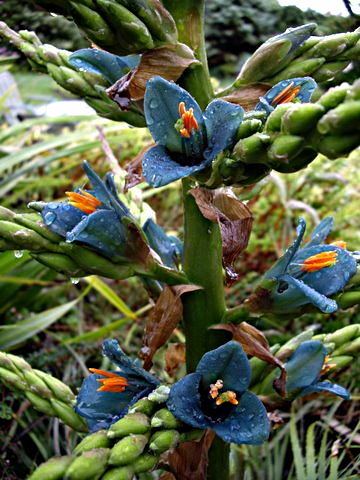 Name: Puya from an Mapuche Indian word meaning "point"
The genus Puya includes at least 168 large terrestrial Bromeliads from the South American Andes and elsewhere in South America. 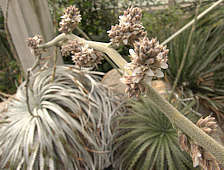 The plants produce a woody central caudex which divides into leafy heads. Many species have razor sharp spines along their leaf margins. The inflorescence is generally large. This terrestrial Bromeliad produces rosettes of elongated bluish leaves with spiny margins and an exceptional flower spike. 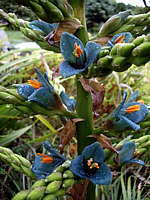 The individual flowers are an intense sky-blue with orange anthers. Their copious nectar attracts pollinating birds. Individual rosettes die after flowering, but before flowering they offset freely from their base to form a clump. Native to Chile and moderately hardy in a sheltered, free draining position. As the foliage has sharp edges, it should be planted at a distance to paths. Left: Growing outside in the alpine rockery at RBG Kew where it has survived several recent harsh winters. 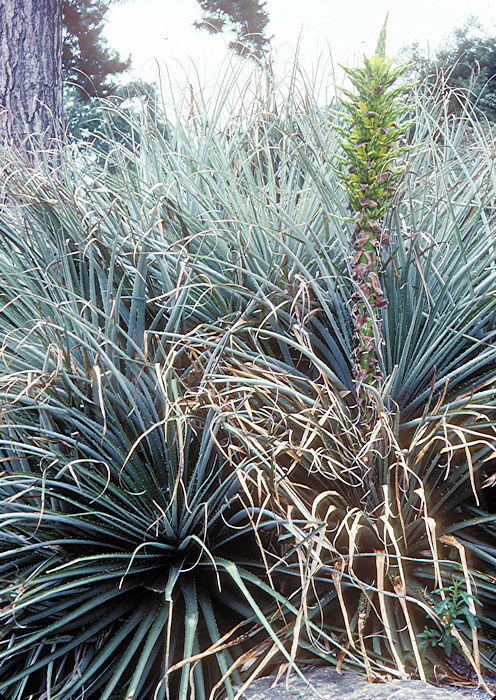 Above: photographs of Puya alpestris by Jan De Nicolo, Highgate Garden, New Zealand. 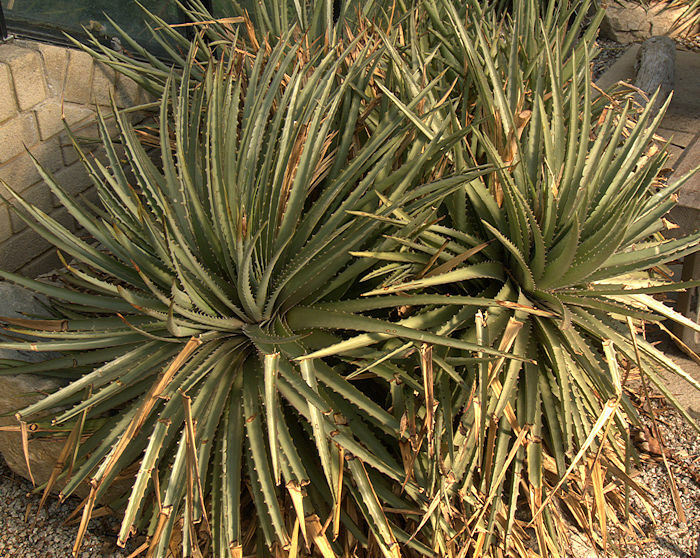 A terrestrial Bromeliad from the arid slopes of the Andes. 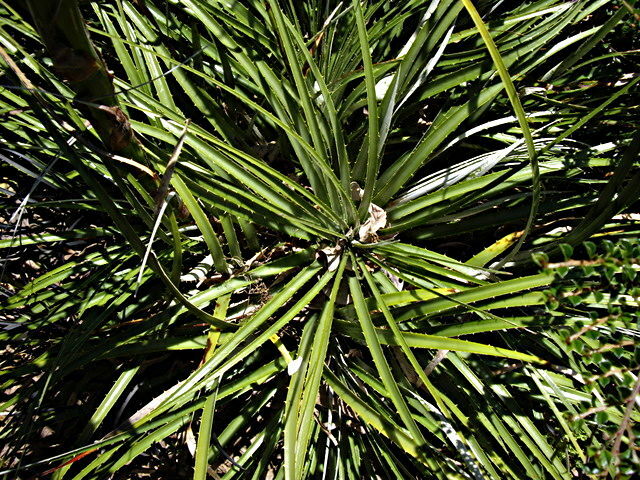 The large rosette is formed from strap-like leaves with sharp, hooked marginal spines. 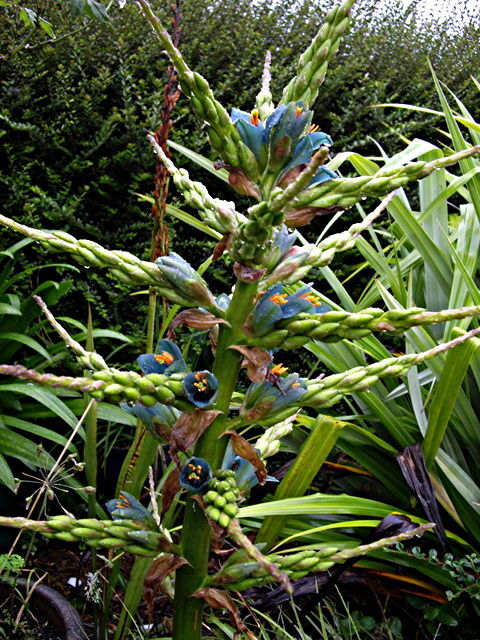 The inflorescence is a dense head of yellowish-green flowers with bright orange anthers, at the end of a 6 - 12 ft stem. The flowers produce copious amounts of nectar and are bird pollinated. Native to Chile. Will tolerate slight frost but dislikes wet Winters. Said to be deer-proof. 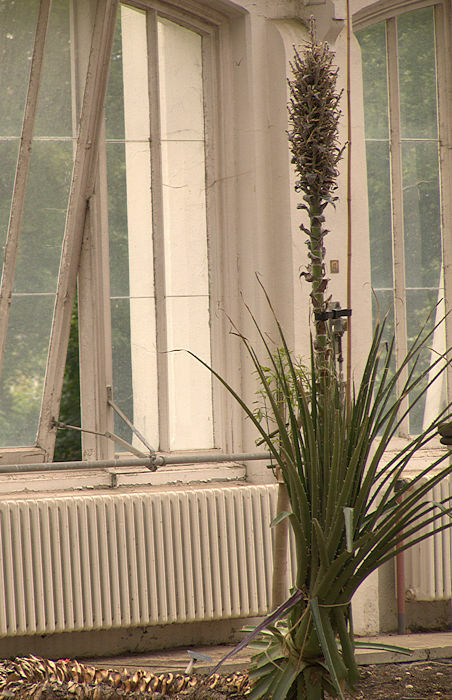 Left: Temperate House, Kew. Flowered after clearance for restoration.